Did you know ACS is Baltimore's First Mercedes-Benz Certified Collision Center? Hear our Story! ACS provides high-quality collision repairs on all vehicles, specializing in service to Baltimore area Mercedes - Benz dealers and vehicle owners. From their humble beginnings as a small corporation, Chuck and Carey Scilipote have developed Auto Collision Specialists into one of Maryland's most reputable collision repair centers. Auto Collision Specialists (ACS) opened its doors in July, 1980 with a crew of one: Chuck Scilipote. Chuck's initial auto body shop consisted of two bays where he did everything from start to finish. ACS now has a collision repair facility that consists of 18 bays and over 20 employees, which include Chuck’s wife, Carey, and their three sons, Charles, Andrew, and Dan. For decades ACS has been providing high-quality collision repairs, specializing in service to Mercedes-Benz dealers and vehicle owners. Auto Collision Specialists takes great pride in the reputation it has built over the decades, and is committed to producing only the highest quality collision repairs. 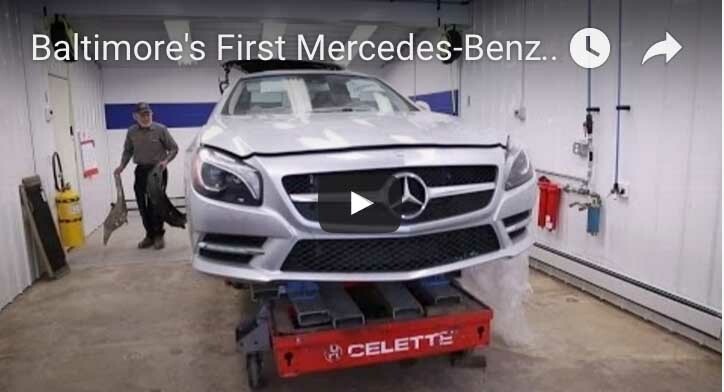 ACS was awarded the title of “Certified Collision Facility approved by Mercedes-Benz,” and has successfully met standards and criteria in facilities, tools, equipment, training, body damage repair procedures, and customer service for collision repairs on Mercedes-Benz vehicles. ACS Continually Invests in Equipment and Training. We operate a variety of computer systems and modern equipment, including the Mercedes-Benz authorized CELETTE frame repair system. We service all makes and models and will happily help you through the process of car insurance repairs.